I credit this find to Harold the hoghunter and blueberry cake donuts..
Two years ago, I went to Rhode Island to visit my buddy and spearfish off Little Compton. Having never been in that part of the country, I was amazed that there was a Dunkin Donuts every other block. At least that is what it seemed like. Harold explained to me that they live off of coffee and donuts in that part of the country, which I still believe. Fast forward to last trapping season when Maryville got it’s first Dunkin Donuts and my quahoggin’ buddy would convince me to make a run up into town. Always on the lookout, I have been watching the large pecan in their backyard and gathered some this afternoon on the way back from town. In the spirit of brotherly love, I uploaded my find onto FallingFruit.org, a website that is dedicated to mapping out free food sources for foragers. My area has very few listed, but some cities are loaded with locations. In an age of self-centeredness and dependence on commercial agriculture http://fallingfruit.org shows a better side of humanity. Helping someone to help themselves. 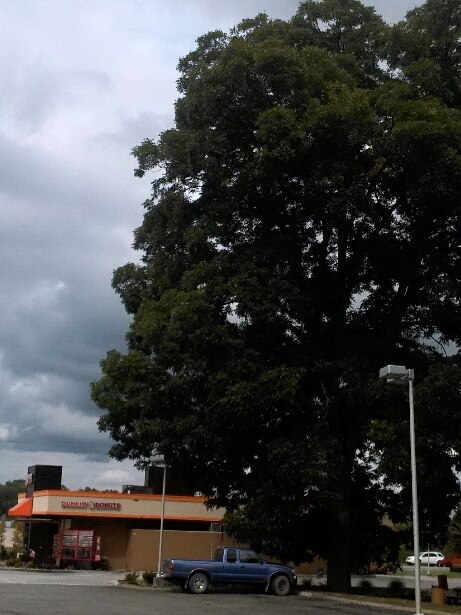 This entry was posted in Foraging and tagged dunkin donuts, fallingfruit.org, foraging, pecan on October 15, 2013 by bigpigoutdoors. I love your blog! I just checked my area in MA, and although we are saturated with Dunkin Donuts, we are not near much free food for foragers. 🙂 If you ever visit Rhode Island again, bring wifey and stop here! (I’m a friend from high school). 😉 Hope you all are enjoying fall. Hey solrevel, thanks for the compliment. Hopefully we will be up that way this year for some coastal foraging with Clammy Harold and will be sure to visit. Keep checking on that site and post stuff up yourself . I like to think of a world where everyone planted edible landscaping, we didn’t spray it with herbicides, and free food was everywhere. Sorry to strike up an old blog but the “http://fallingfruit.org/” site is pretty great. Here I though I was the only person foraging the alleys and main streets in Minneapolis. OK, it’s not exactly my typical stomping grounds but life has lead me here and left me with no choice but to spend some time picking lunch from thy neighbors (including the cities) plantings. It reminds me of a bike ride I was on with the misses when I kept stopping to munch on mulberries. Man, it was a good year in the Twin Cities for mulberries (and peaches!). I couldn’t get up to speed on my bike before cutting off an old lady with groceries to address the level of sugar in the fruit that hadn’t stained the ground as of yet. Yeah, it did take us a lot longer to knock off those 25 miles when i kept stopping to fill up. I just had to remind her of a few words I was told by a wise person one day “You never pass up a free meal, as you never know when you’ll have your next”. Thanks for the brainwashing! “Never pass up a food source” is exactly what Mors said on our walkabout 13 years ago. Wise words indeed.